Often times, the solutions to our toughest challenges can be taken from nature. In the past couple of years, scientists discovered the mechanism by which a bacterium protects itself against viral infection using a cellular defense system called CRISPR. CRISPR has many potential applications in science as a tool for genetic manipulation. Boulder’s February Café featured Drs. Tess Eidem, Stephanie Moon, and PhD Candidate Briana Van Treeck of the CU BioFrontiers Institute. These scientists first gave us a brief overview of what CRISPR/Cas 9 was and described to us how the system worked. We then participated in two skits in order to put what we had learned into action and visualize the various interactions happening inside cells. Finally, we wrapped up by discussing the ethical implications not only of using CRISPR, but also of genetic manipulation as a whole. Clustered Regularly-Interspaced Short Palindromic Repeats are segments of prokaryotic DNA containing short repetitions of base sequences. Each repetition is followed by short segments of “spacer DNA” from previous exposures to a bacterial virus or plasmid. The CRISPR/Cas system is a prokaryotic immune system that confers resistance to foreign genetic elements such as plasmids and phages, and provides a form of acquired immunity. CRISPR spacers recognize and cut these exogenous genetic elements in a manner analogous to RNA interference in eukaryotic organisms. CRISPRs are found in approximately 40% of sequenced bacteria genomes and 90% of sequenced archaea. The CRISPR interference technique has enormous potential application, including altering the germline of humans, animals and other organisms, and modifying the genes of food crops. By delivering the Cas9 protein and appropriate guide RNAs into a cell, the organism’s genome can be cut at any desired location. CRISPRs have been used in concert with specific endonuclease enzymes for genome editing and gene regulation in species throughout the tree of life. Ethical concerns have been expressed about the prospect of using this nascent biotechnology for editing the human germline. Our activity for the Café was acting out two skits to better understand the CRISPR-Cas9 system as a whole. 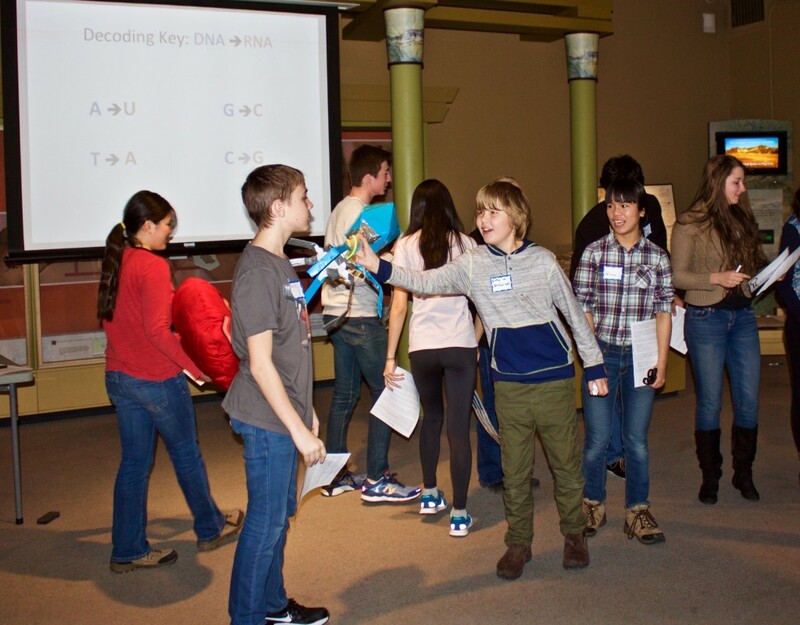 Participants played roles such as a bacteriophage, bacterium, CRISPR DNA, Cas9, Viral DNA, tracrRNA, crRNA, a plasmid, etc. and used props to show how the different elements interacted. The first skit described how the CRISPR system works as a bacterial defense. Specifically, this skit followed a bacterium that gets infected by viral DNA, incorporates CRISPR DNA as part of its genome, and then activates its CRISPR immune system through the formation of tracrRNA, crRNA, and Cas9 to destroy future viral DNA. The second skit described how scientists are changing this system in different ways for use as a biological and medical tool. 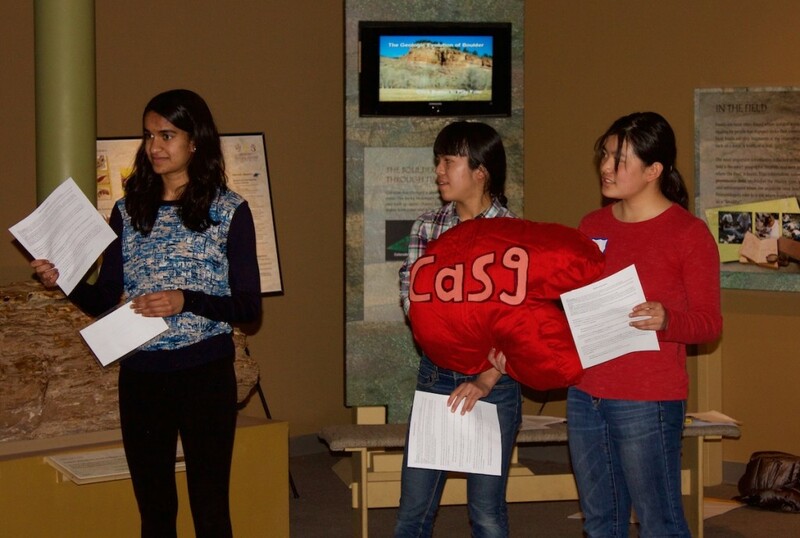 Specifically, the skit explored the process by which a sick human cell utilized the Cas9 endonuclease to replace mutated genes.